A magnificent interior remarkably unspoilt but I have to agree with holbornboy about the beers. I was not inclined to have a session. I first visited this pub a couple of years ago and can confirm that the interior is indeed quite magnificent. However, the selection of beers on that occasion was poor and low in quality. I paid a return visit last week and nothing has changed. There are six handpumps (two were not in use) dispensing an uninteresting range - Landlord, Deuchars, McEwans 80/- and Stewarts 80/-. My pint of Deuchars was warm and flat and as dead as a dodo. If you want to see a beautifully unspoilt bar you will not be disappointed. Just don't expect a decent pint. Good pub, proper client�le, what a good pub should be, friendly and knowledgeable. CAMRA National Inventory gem about 2 miles south of the city centre in the suburb of Newington. There are feasts for the eye almost everywhere, from the etched windows (John Leslie, any relation? )It features two superbly traditional long rooms along a central island bar, with doors connecting the two at the front and back. The left room has snob screens near the window which creates a separate, snug feel, with its own access to the bar- as noted this is a hatch at waist level and you have to duck if you wish to see the staff! I recommend you do as they are friendly and welcoming to the outsider. 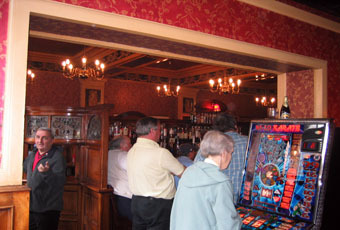 The bar itself is made from carved dark wood and features a clock at the top end. There is a similar clock outside the front door. Above the screens and bar is a handsome plastered Victorian ceiling, similar to the one in the Abbotsford. Real ale was Deuchars, Landlord and guests from Scottish microbreweries such as Stewart of Edinburgh and Hebridean- a good selection. I had a Hebridean Gold which was in good form and served with a smile. Funnily enough, the pub this reminded me of most is the Princess Louise in Holborn, although without the tiling or mirrors. It's equally resplendent though, and is worth any bus trip from the centre. Not to be missed if you're a traditional pub lover. A wonderful pub that those with a liking for beautiful pub interiors should seek out. To the right of the entrance is a traditional bar counter whilst going to the left and through to the snug you'll find a wood and glass panelled bar with four serving hatches rather like train station ticket booths. There's a wonderfully decorative ceiling and hanging chandeliers provide low lighting. There are separate panelled rooms leading off each of the two bars decorated with old oil paintings. I believe the architect was the same one who designed the Abbotsford in Rose St. The seating is comfortable and the tables are small with inlaid brass/copper. Everything is clean and tidy and with four handpumps this place is a must visit. From the City Centre you can get there on bus numbers 42 or 67.